For more than 30 years, the sound forge Audiodata, with registered office in Aachen/Germany, is considered synonymously with perfect sound. In the professional audio world, particularly among the music lovers with the highest quality standards, the speakers of company founder and chief developer Peter Schippers have an excellent reputation. In spring this year, there was a new start: Since then, Hannes Palfinger from Salzburg stands behind the newly founded Audiodata Lautsprecher GmbH with registered office in Hallwang near Salzburg. Together with co-shareholder Franz Stöger and his TonArt studio, the service of previously sold speakers now occurs in Austria. In the near future, the speaker series “Avance” will be updated, which is brought up to the latest state of the art in both look and sound. The first high-end speaker “made in Austria” will subsequently be presented at HIGH END 2015 in Munich. The story started with the high-end brand Audiodata in 1982 in the German city of Aachen: At that time, Peter Schipper – as a young Hi-Fi pioneer – for the first time used modern computer technology to minimise the production tolerances and material compromises customary in the speakers at that time. The results were stereo speaker systems, the sound quality of which was inspiring and which is still used today as reference status by the experts. The special feature of these speakers is the “correctly timed rendition”: In conventional speakers, the tweeters are processing the signals at a faster rate than the midrange speakers; Audiodata manages that the signals are reaching the ear at approximately the same time; result is the perfect stereo panorama and maximum spatial depth. 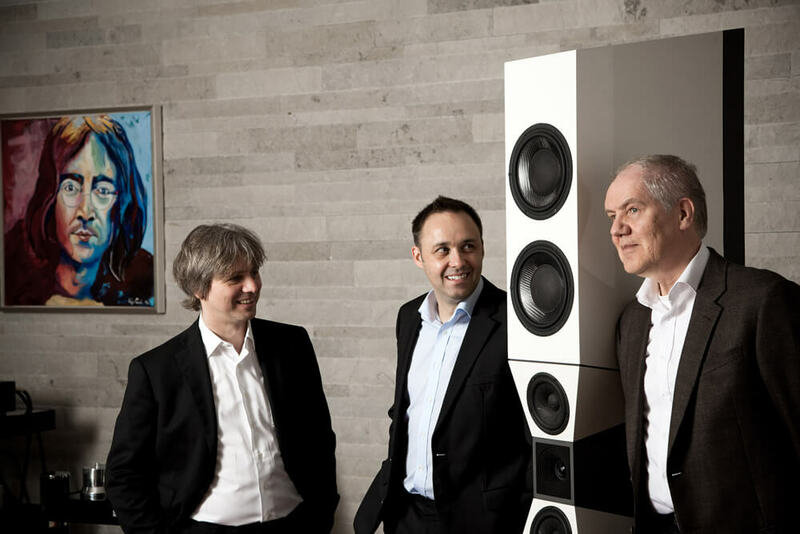 In cooperation with company founder Peter Schipper (60), Hannes Palfinger (41) of Salzburg and the Vöcklabruck Hi-Fi dealer Franz Stöger (46) now attempt to take on the world of high-end speakers. The newly founded “Audiodata Lautsprecher GmbH” with registered office in Hallwang near Salzburg as well as the Showroom Vöcklabruck already offers sound and visual updates for classical Audiodata speakers: The entire spare parts warehouse for all previous speakers has already moved to Austria. Hannes Palfinger has been infected with the love for high quality speakers in his teens: “At the age of 16, I loved tinkering around with speakers and filing on the sound. In my search for a competent Hi-Fi dealer I met Franz Stöger, who shared my passion for the perfect sound”, he remembers. Both also shared their preference for speakers of the Audiodata brand: “They are able to render sound in a deluge and spatially perfect and make the music experience instantly come to life”, so Franz Stöger. Peter Schippers shall continue to contribute his vast experience to the technical development sector. At Audiodata Lautsprecher GmbH, Hannes Palfinger is responsible for the sectors organisation, finances, marketing and distribution, Franz Stöger for development and production.